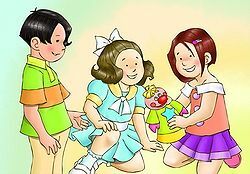 Cartoon drawing of children playing. The term child has two meanings. First, it describes a family relationship: a person is the child of his or her parents. Second, "child" is used to refer to any young human. Depending on the context, a child is a person up to age 14, 16 or 18. Male children are called boys and female children are called girls. Up to age 1 or 2, a child is called a baby, and up to age 3 or 4, a toddler. Next comes pre-school age, then at school age a child becomes a schoolchild. Children up to age 12 are called preteens and children aged 13 and older are called teenagers or teens. Between roughly age 14 and 18 (in some places 21), they are also called adolescents. All people below the age of majority are summarized in the term minors. Human civilization demands that children are a) cared for by their parents (fed, cleaned, clothed, protected from dangers, etc. ), b) educated to learn all the things they need to know to live in society. Formal education is given to children by professional teachers in schools. Children enjoy special benefits and legal rights compared to adults, such as free lodging, nourishment, medical care, schooling, no (or strongly reduced) jurisdictional responsiblilities and consequences for crimes, etc. In other aspects, however, children enjoy less rights than adults. For example, they are legally not permitted to vote or to candidate for election. They are also restricted from buying or consuming alcohol, tobacco, or "adult" media such as adult books or videos. In some countries, minors are also forbidden to labor. In addition to these legal prohibitions come many restricting rules given to them by their parents and guardians, which are often enforced by punishment in case of disobedience, including corporal punishment such as spanking. Spanking parody of a childhood pirate sketch (c. age 8) drawn in the same style (Jameslovebirch, 2012). In past centuries, pedagogics (the art and science of educating children) relied strongly on the principles of lecture and punishment. Children who failed to meet the expected standards of good behavior and learning progress would be punished, often by corporal punishment. Punishments varied strongly, of course, but at home and school, from antiquity to the 19th century, the most common type of corporal punishment was (disciplinary) spanking. Since the end of the 19th century, pedagogics is in a revolutionary process of abandoning all forms of corporal punishment, or punishment in general. Modern pedagogics applies more sophisticated and more "positive" methods of teaching, such as positive reenforcement. As a result of this new thinking, school corporal punishment was forbidden in many countries and states in the course of the the 20th century. Nevertheless, in many countries and states children are still spanked at school, and in by far most places, parents are still permitted to spank their children for punishment as long as the spanking is not abusive. For artwork and literature on the subject of spanking children, see the article child spanking art. For spanking art created by children, see children's spanking drawings.